Christmas comes around again and so does the shopping. Image by Domaniqs from Wikipedia. 1) Start early. From now until the first week of December you will find all kinds of sales where whole stores have 20% off Christmas buying. This includes everything from trinkets, toys and clothes to supermarkets selling off legs of ham before everyone gets desperate and pays top dollar. So break your own rule here (or maybe it is just mine) and do start Christmas shopping before December 1st as it can save you heaps. 2) Last year I was buying some Chanel after shave. Yes, expensive I know. I shopped around for a good price but it was a standardised price everywhere even online. Chanel has a name and it is not to be sullied by being discounted. After I had paid and the chemist's assistant was putting the finishing touch on my gift wrapping (see point 4) I saw the SIGN. It said there would be a special shopping night where all gifts were 15% off. Lesson learnt. 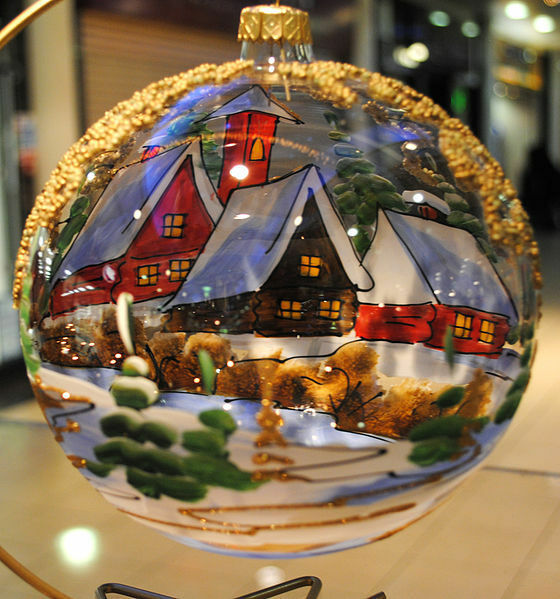 Learn which shops have these special nights and make sure you hold off and shop on them. 3) The shops make big money out of Christmas not simply because of gift buying but because you go to the shops and see things that you want for yourself. The answer is to be strict with yourself. Unless it is a present you cannot buy it. It will be cheaper after Christmas in any case if you really still want it. 4) Do take advantage of any shop that offers gift wrapping. It will save you heaps on expensive paper and ribbon plus there is NOTHING worse than looking at the mound of presents on Christmas Eve and thinking to yourself, some poor mug has to wrap all these and my partner has conveniently taken himself off to bed. 5) Five dollars won't buy you a bit of plastic in the shopping centres but I was simply enthralled to find what you can get at some of the local craft markets which seem to specialise in innovative ideas that do not cost the earth. I went to the Eltham Craft Market and I have to say it was fantastic. Here are some of the innovative gifts I bought. Luckily the new owners are too young to know how to use the Internet so I won't be wrecking any surprises. 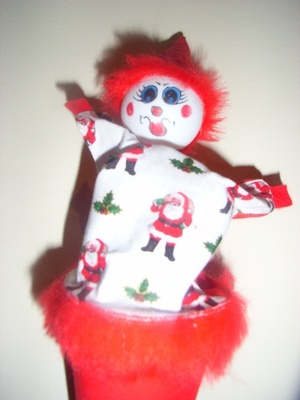 This is a pop up santa-clown on a stick. Great for a game of peek-a-boo with a baby. What $5 will buy you in a market. 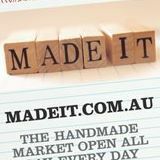 I also found that for people who cannot get to the pre Christmas markets that there is an innovative site called madeit.com.au where heaps of the crafties stock their wares. Great for unique handmade gifts. Website that a lot of people probably don't know about which provides an alternative to the normal mass produced goods at shopping centres. 6) You know it is true if you can be bothered. You should buy what you can in the post-Christmas sales. That bit of plastic will have come down considerably. Now put that gift away until next Christmas so you have a head start for next year. Before going christmas shopping go thru your own cupboards & check if there is anything suitable to give to a friend or neighbour or work collegue. You may even be able to make up a small basket of goodies,body lotion,hand cream, and don't forget gifts for the less fortunate/children,plenty of charities are needing donations,new not pre-loved. Going thru your cupboards is just like Christmas!! Kris Kringle is a good idea. As for going through one's cupboards - inspired thinking! great tips. Thanks Nadine. But another one tip you may have forgotten is DAISO you can buy a few gift bags and other things.